Nestled among the trees along Old Oxford Highway in Durham County are remnants of one of the largest plantations in the antebellum south. Before the cities of Raleigh and Durham were founded, Stagville was the center of an enormous estate comprised of almost 30,000 acres of land, worked by 900 slaves. Today the historic site sits on seventy-one of its original acres, divided on three tracts. Other original structures remaining on the Stagville site include a pre-Revolutionary War yeoman farmer’s home and a massive timber-framed barn, built entirely by enslaved workers. A family cemetery is also on the premises. Attempts to find the burial grounds of former slaves have been unsuccessful. The Visitor's Information Center at Historic Stagville is loaded with audio and visual materials to help guests learn more about plantation life in the south and African and European traditions. In addition, staff members at the center are working on an on-going Family Tree Project to trace the ancestry of enslaved persons once residing and working at Stagville. As with any historical site, tales of unexplained phenomena are told of Historic Stagville. 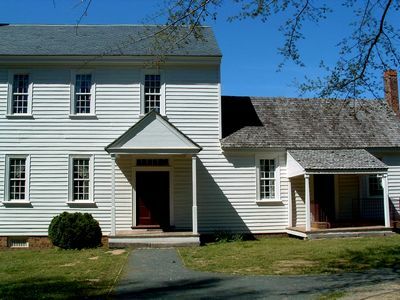 Odd occurrences at the site, primarily in the main plantation house, and numerous reports of ghostly sightings of a young girl wandering around Horton Grove and a man inside of the Great Barn, prompted a paranormal investigative team to visit Stagville. Historic Stagville is located at 5828 Old Oxford Highway, Durham. Hours are Tuesday - Saturday from 10 - 4. Guided tours leave on the hour from 10 - 3. Admission is free. Tours take about an hour, the Visitor's Center is sometimes locked when a tour is out, so be sure to call in advance. Site has accessible parking, however wheelchair access is not available in all of the historic buildings. For more info: phone Historic Stagville at 919.620.0120.